Mushrooms are excellent for a great many things, one of which is stuffing. 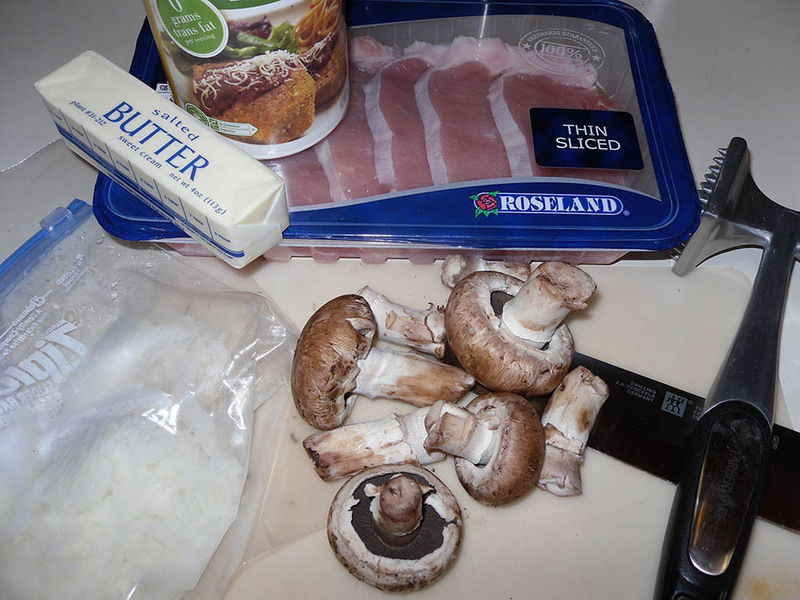 I love to put mushrooms in my stuffing because it give it moisture and body. Pork is an excellent vessel too. 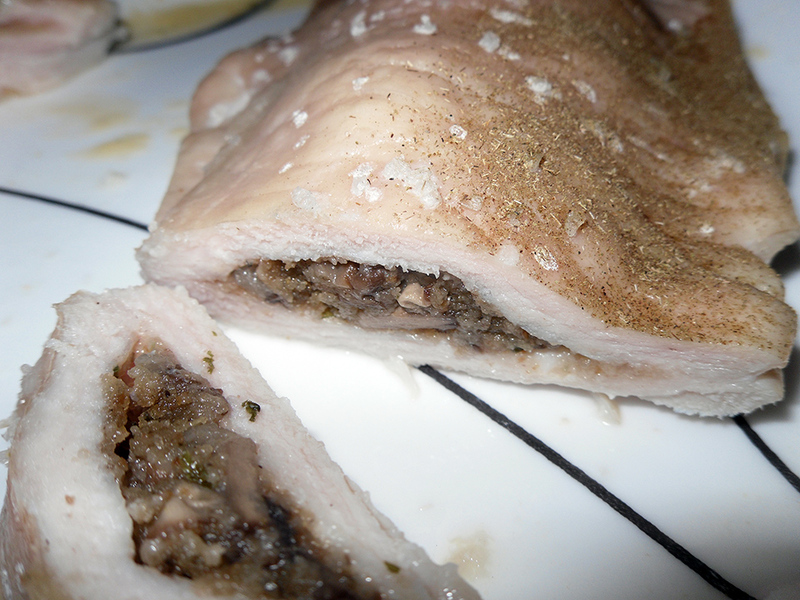 It cooks quickly and has a nice flavor that benefits from stuffing. 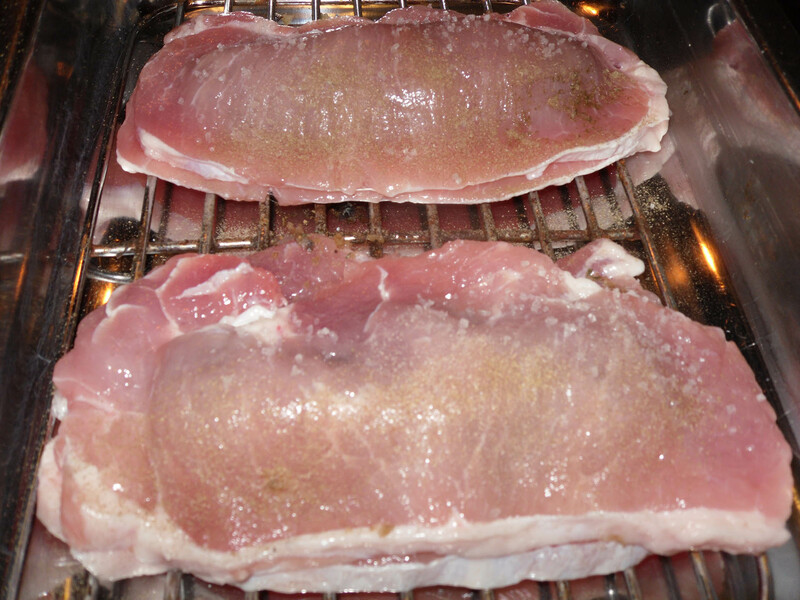 These pork chops take about 20 minutes to make including baking, nice and easy. Before we get started I’d like to note that I much prefer to use thin chops and pound them to a nice even quarter inch thickness rather than take a hefty chop and slice it down the center. 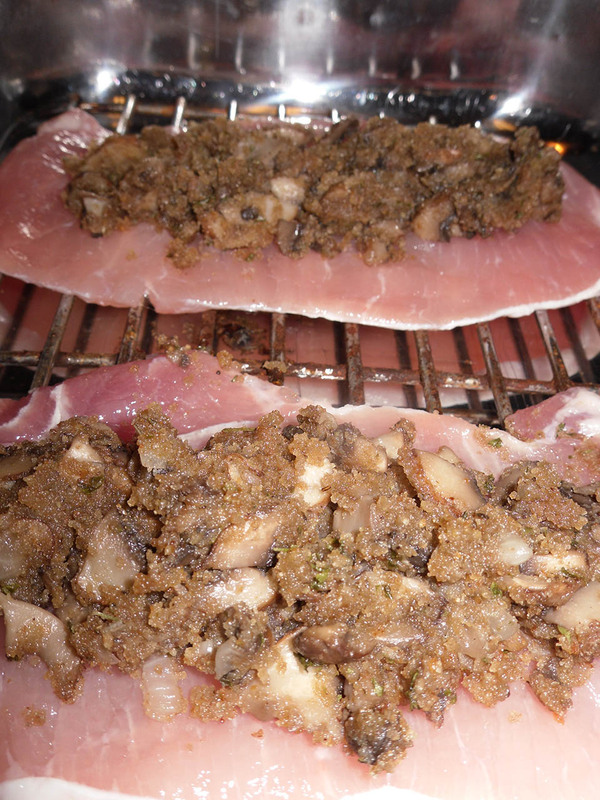 These take less time too cook and you don’t run the risk of undercooking the stuffing (thus capturing raw pork juice). salt and pepper and place on your baking pan. 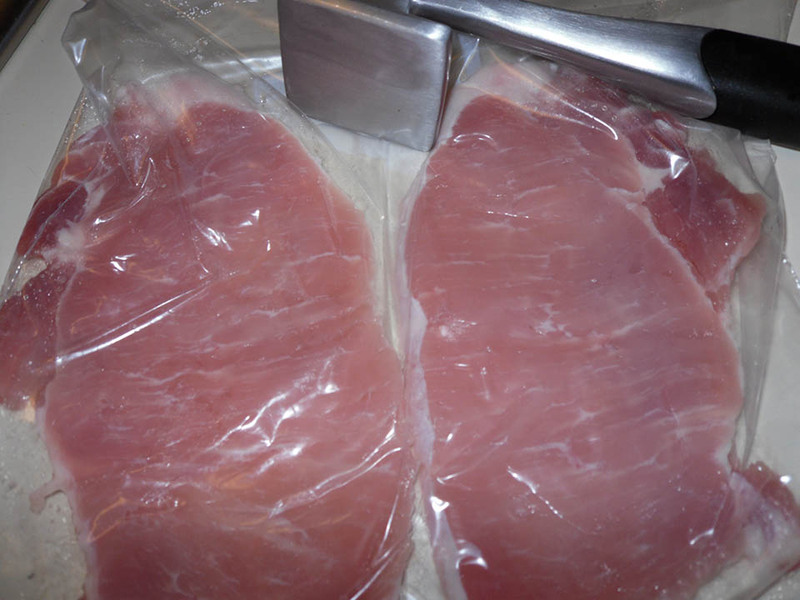 Repeat with the other two chops, leave them in the bag until ready to top your stuffing filled pork chop. Melt your butter over medium high heat in a small pot. Sauté onion until translucent. 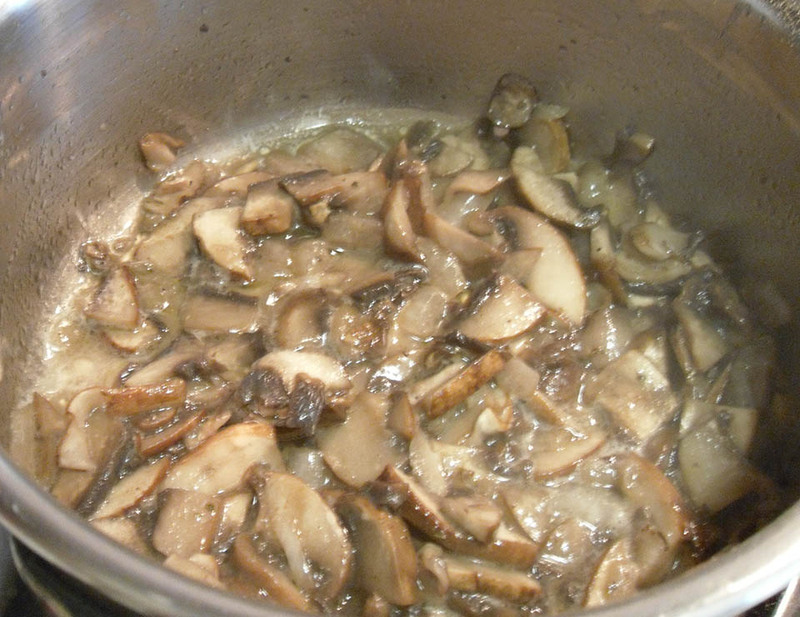 Add mushrooms and sauté until they release their liquid. Add the bread crumbs and stir until most of the moisture is absorbed. Place half the stuffing on to each chop in an oblong shape staying a half inch from the edges. Place your other seasoned pork chop on top making sure the edges touch. Dust with a little ground thyme and cover with cream of mushroom soup (I skipped this step so you could make out what was going on in the photos). Bake at 400 degrees for 15-20 minutes. Check internal temperature for desired doneness. These are to DIE for! Play with the filling too. You can add chopped apples, rasins, garlic, etc. you name it! Pork is a juicy blank canvas and these are so thin you don’t have to worry about getting raw oogie-boogies.